The RAPTOR NANO is a low cost thermal imager kit that features standard and extreme long range lenses. The Raptor Nano is a complete kit with everything you need. 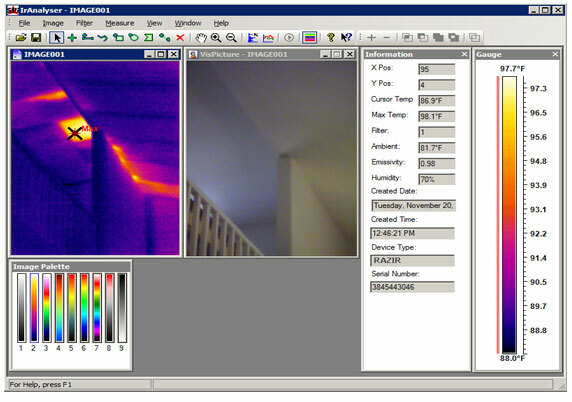 Live thermal VIDEO recording lets you document your inspection like never before. Record thermal infrared video right to the cameras memory card. You can also directly connect the Nano to a PC (via USB) and perform real time analysis through the included thermal analysis software. More about the Large Screen 2GB Removable SD card and internal image storage options. 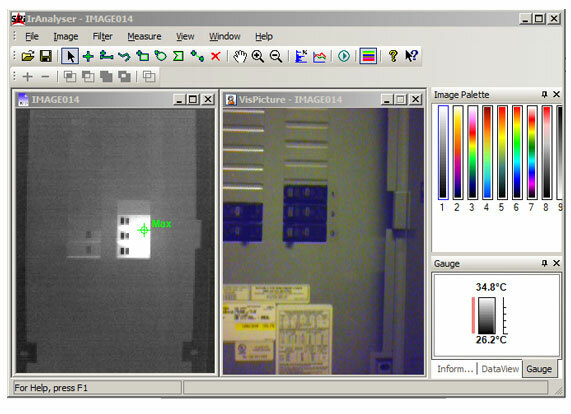 Thermal/visible images (JPEG format), Thermal Video and voice comments are stored on the SD Card or internally for easy download. Touch screen technology. The Nano incorporates an intuitive touch screen interface that you are already comfortable using in todays most popular cell phones. 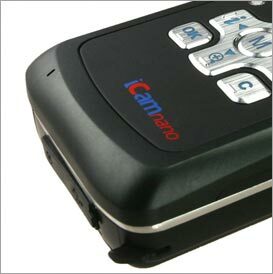 Control all camera functions from dedicated buttons or the touch screen menu controls. The Nano gives you options. More about Touch Screen True second generation advanced AUTO-FOCUS technology. Sharp detailed thermal imaging is just a button push away. Use auto focus or manual focus based on your needs. Integrated CMOS camera provides high resolution visible images alongside your thermal imager. View full screen visual images, thermal images or use the advanced fusion option to overlay the thermal image on the visual image to pinpoint problem areas. More about CMOS Camera Universal connections for external AC power, NTSC/PAL video output and USB PC camera interface so you can easily access your data the way that you want to. Voice annotation lets you record voice comments in the field and attach them to a thermal and visual image. Now you can keep all your notes organized for later report generation. This model is a new pocket sized addition to the product family. This means you are getting the most up to date technology securing your investment for years to come. Accurate radiometric temperature measurement up to 482 Degrees lets you acurately quantify the temperature of any pixel in the scene you are viewing. Industry standard consumer JPEG image storage format. No proprietary software needed to view and transfer thermal images to your PC. Fusion Technology overlays the thermal image onto the CMOS visible image for sensor fusion. Control the amount of blend to best highlight the target area. The World Wide Choice of professionals. Now shipping to destinations around the world. Our Export Team can assist you in international shipments. 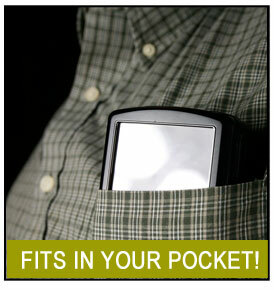 The RAZ-IR® family of infrared camera solutions now has an advanced pocket sized solution! In response to feedback from thousands of customers, the new RAZ-IR NANO® thermal imager now includes the advanced features you want. The new NANO® takes pocket size thermal imaging to a whole new level. Never before has such a small and affordable system offered features like; Live Thermal Video recording, Intuitive Touch Screen Interface, Thermal / Visual Image Fusion, Voice Annotation, Video Output, JPEG Image Storage and a Pocket Size Design. SEE what the NANO® can do for you! Get more for your money and deliver more to your customers with the revolutionary RAZ-IR NANO®. The Thermal Camera thats easy on your pocket AND fits in your pocket! The RAZ-IR NANO® connects to your life through universal standard connection ports. Need to run off of vehicle power? Need to capture live thermal video directly to a PC? Do you want to plug the camera into the wall for extended analysis? No Problem! Power the NANO® through long life rechargeable LiOn batteries (2 batteries come standard in the NANO® kit) or external power sources. Want a really big screen view? Easy! Connect the NANO® to common monitors and TV sets using the NTSC video output port. The NTSC video format is the standard format used by your TV set. If you need it the NANO® can even output PAL Worldwide video standard. Need to present your thermal report to a customer or superior? No problem! Produce dramatic thermal video presentations that can be emailed, burned to CD or posted on the web. Time to connect to your computer? The NANO® speaks PC using the USB (Universal Serial Bus) connection on every computer. Simply plug the NANO® into your PC and your ready to go. Download images or capture live video direct to your PC. If you just want the pictures in a hurry you can even print the JPEG format images directly to a memory card enabled printer from the NANO® SD card. The NANO® Connects! The RAZ-IR NANO® is the result of careful analysis and feedback from thousands of RAZ-IR® thermal camera users. The need for image storage options has been addressed on many levels. Internal as well as removeable image storage options are demanded on todays thermal imagers. The RAZ-IR NANO® uses consumer SD memory cards that are readily available at common electronics retailers worldwide. A 2GB SD card is standard with the NANO® and can store thousands of images. A single card can be used for images, thermal video and voice annotation but you also have the option of obtaining additional cards for backup. Some people use a different card for each job. The NANO® gives you choices and you are not limited to just the SD card. In the real world stuff happens. Cards can be lost or left behind. Occassionaly, cards even become corrupt and unusable. Never fear the NANO® has got you covered. In addition to the SD Card image storage the NANO® has an internal image storage capacity that lets you save images (thermal and visual), thermal video and voice comments internaly with no SD Card required. With the RAZ-IR NANO® you will never have to say "I can't finish the job". Do you want to stand out amongst your competition by deliverying unique high quality thermal reports? Have you ever wanted to document a moving process or scan across a wall without taking multiple images? Have you ever wanted to capture time vs. temperature data or thermal video directly to your PC? Feedback from thousands of users says you do. The NANO® thermal camera answers with a big YES. Once only found on top dollar high end systems, these features are now standard on the NANO®. 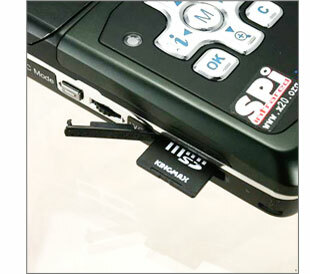 You can record thermal video in real time live in the field directly to the NANO®. You can connect the NANO® to a PC via USB connection and stream real time thermal video directly to the included Thermal Analysis software. Does it make sense to have an ultra exotic thermal infrared sensor sitting next to a low quality low resolution visual camera? Of course not. The thermal image is only half the job. A professional report includes both thermal and visual light images of the problem areas. Many cameras look at the visual camera as a cheap afterthought. Not the NANO®. 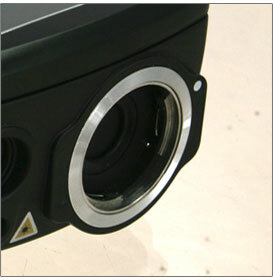 This system boasts and ultra clean 2 Megapixel video sensor. The NANO® automatically saves brilliant visual light images alongside the thermal images for easy report generation. Buying a thermal camera with a low end visual camera is like doing half the job. Don't settle for half a camera get the NANO®. With the explosion of todays popular smart phone technologies the touch screen interface has become the standard in technology for human interface in portable devices. 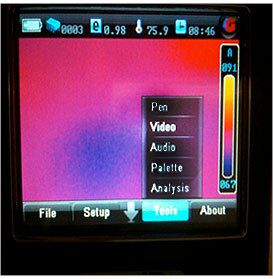 Don't you think that your exotic thermal imager should keep up with your cell phone? We do. 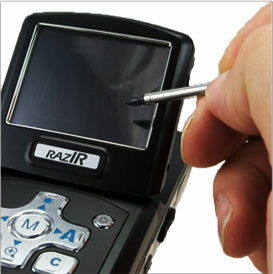 Thats why the affordable RAZ-IR NANO® has been designed with an intuitive touch screen control interface. However, the RAZ-IR® family is all about options so you are not limited when it comes to a control interface. 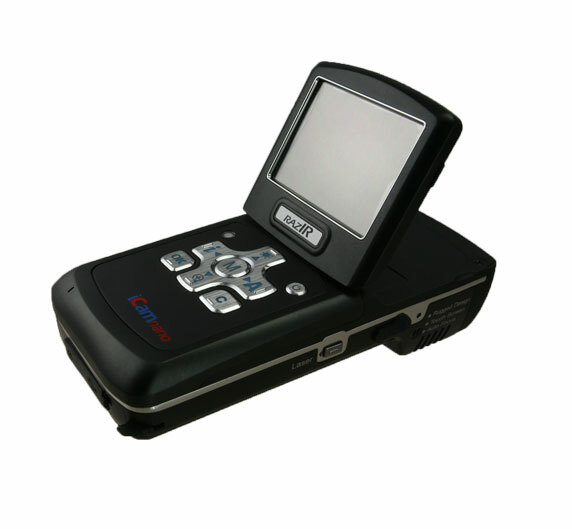 The onscreen menus of the NANO® can be controlled via the breakthrough touch screen interface or from standard control buttons on the camera. 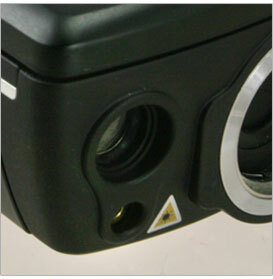 In addition, many common features are directly controlled with a single button push on the thermal camera. You can decide which interface is most comfortable for you to use. Pick the one you like most or use different control options for different jobs based on the particular needs of that thermal application. We give you choices you make the decisions, thats what the NANO® is all about. AUTO-FOCUS technology has long been available on consumer digital and video cameras but it is a relatively new feature for thermal cameras. The new RAZ-IR NANO® leverages years of experience in thermal infrared auto-focus to bring you the next generation of infrared autofocus. Unleashing this powerful feature is as simple as pushing a button thanks to the intuitive onscreen menu design of the NANO®. The focus mode gives you three easy options; Focus Near, Focus Far and Auto Focus. You decide which is best for your particular application. Internal focus also means that you can comfortably use the NANO® camera in the field with just one hand. No more reaching around for the manual focus and hunting back and forth for the perfect focus. Now, you can just push a button and zoom right into focus. If you need to adjust the focus its just a simple button push as well. RAZ-IR NANO® Second Generation AUTO FOCUS means less time fiddling with the camera and more time getting the job done! Accurate temperature measurement is the heart and soul of a good thermal infrared camera. With the RAZ-IR NANO® you get Radiometric Temperature Measurement. Not only do you see visually what is hot and cold in the image but you can also read the temperature of any point in the scene. Simply put the crosshair on the spot that you wish to measure and the NANO® does the rest, in real time. The crosshair is moveable so you can keep everything in the scene that you want to and move the crosshair to the desired point of interest for accurate temperature measurement. The NANO® also provides advanced features allowing you to place multiple spots on the image for real time multispot thermal analysis. The NANO® doesn't stop there. Access high end functions in REAL TIME on the NANO® camera. Draw a line on screen and plot the temperatures along that line. Draw a box and analyze the min, max or average temperature within that area. Draw an irregular shape and perform the same analysis. Use the ISO-THERM function to select a specific temperture range and have that range be colored in a specific color throughout the image. All this is available on the NANO® in real time within the camera itself. If you want to get even more accurate data the NANO® allows you to adjust emissivity, ambient temperature, distance to object and even humidity to further calibrate the temperature data. Once you find a problem push a button and save the image. Download that image into the RAZ-IR® Analyzer LAB software (included with every NANO® camera) and a world of further analysis options opens up. Every pixel in every image is fully calibrated and contains radiometric temperature data. The NANO® is a full screen radiometric thermal imager. Complex temperature measurement functions such as multiple spot, bounding box, Min/Max/Average, histogram, Delta T and more are easy to implement in the Analyzer software package making your reports look professional and comprehensive. Connect the NANO® via standard USB interface and you can view live thermal video directly from the NANO® sensor in real time within the ANALYZER LAB software. This high end function lets you view, analyze and capture thermal video as well as control the NANO® thermal camera from your PC. The NANO® comes standard with a temperature range of up to 482 degrees so you can measure a wide range of conditions typically found in industrial settings (if your electrical panel is over 482 degrees there's definitely a problem). The NANO® recognizes that each situation is unique. Need to measure higher temperatures? No problem, the NANO® is available with an optional high temperature calibration that lets you measure temperatures up to 662 degrees. Thats Hot!